Willow Creek Rug Hooking is proud to announce that they have secured exclusive use of the patterns from Eaton's department store. These hard to find patterns have a great retro look and feel and are a pleasure to hook. on Primitive Linen is approximately 16x30. All Eaton's pattern are re-produced with permission from Sears Canada Inc., owner of the Eaton's trademark. 24" x 36"on primitive linen. 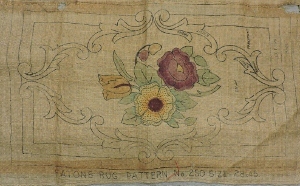 These patterns were produced for Eaton's by the Garrett Co. of Nova Scotia and are being reproduce by WCRH with permission from Sears Canada, owner of the Eaton's Trademark. 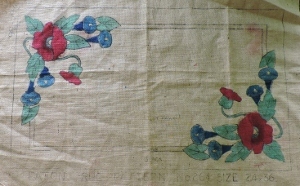 The Eaton's company purchased patterns from The Garrett company in Nova Scotia. We have a selection of patterns, reproduced with permission from Sears Canada who own the Eaton's trademark. Hooking an Eaton pattern is to hook a bit of our Canadian rug hooking heritage. They are printed on primitive linen, but can be special ordered on traditional if that is your preferred backing. ©2014-2018 Willow Creek Rug Hooking. All rights reserved.